What Will Wearing Braces Be Like? Whether you are currently wearing braces or looking into getting some, knowing what your life with braces will look (and feel) like can help you prepare for success and choose the right form of treatment for your needs and lifestyle. Belmar Orthodontics can help educate you on what to expect wearing braces and what you can do now to achieve the best outcome. Braces have been around for many centuries. Researchers have found that orthodontic appliances actually date back as early as 1000 B.C. Even then people were anxious to straighten out their smiles. Braces are appliances that exert a certain amount of force on the teeth in order to align the top and bottom sets of teeth as well as the upper and lower jaw. The goal is to have a straight smile with teeth that are set in a beautiful arch around the mouth and jaws that line up with the teeth coming together evenly. Braces consist of brackets, wires and bands. On the teeth, they look like metal squares on each tooth with metal wires going through those metal squares. The squares are the brackets and they are cemented to the center of each tooth with a special bonding agent. The bracket is designed so that it can support a wire (called an archwire) that will go through it. Think of all these brackets as tiny workers who are holding up a strong wire. There are two archwires: one that goes along the top teeth and one that goes along the bottom teeth. These archwires help shape the arch of the teeth in the mouth so that they make a perfect arch and so the upper and lower teeth line up with one another. Traditional metal braces also have rubber bands that go around each individual bracket. These are to help the gums from catching on the metal bracket hooks and also provide a patient the ability to add a pop of color to their mouth. Bands come in all different shades and can be customized to what you like. Traditional Metal Braces – This is the option we explained above, and the most popular option among patients. This is also the most economical choice when it comes to price. Incognito Lingual Braces – This is an option similar to traditional metal braces and are popular with professionals and adults. The brackets are bonded to the back of the teeth and provide a hidden straightening apparatus to patients. Patients will adjust to these braces much the same as traditional metal braces, only they’ll feel the brackets on the tongue-side of their teeth instead of the cheek side. Clear Ceramic Braces – Much like metal braces, this system uses brackets to align the teeth. However, the brackets are made from ceramic and their white material blends in with the teeth. Even the wires can be made white. These will act and feel the same as metal braces, only with better blending with the teeth and greater stain-fighting power. Invisalign – This is a system of progressive, custom-fit aligners that gently move the teeth into their ideal position. The clear, removable design of these aligners renders this orthodontic treatment virtually invisible to others. It will feel like you are wearing a snug retainer or covering for the teeth and needs to be worn throughout the day. This treatment method allows patients to drink, eat and clean the teeth normally and with ease. There is some discomfort and adjustment when first wearing braces. Because the brackets are bonded to the teeth and there are archwires adjusting the position of the teeth, you may be sore for a few days. It’s best to eat soft foods the first few days as your teeth adjust to their appliances. A simple over-the-counter painkiller can help with discomfort. Although many patients feel mild discomfort when first wearing braces, some patients don’t. It will take a few days to get used to the brackets and wires. You will be able to feel them during the day as they sit against your cheeks. However, you will get used to them in about 1-3 days to the point where you won’t even notice your braces. They will soon become a part of you and cleaning them as well as going to orthodontic appointments will become routine. As with any new thing, there is always an adjustment period. With braces, that adjustment period is short. When it comes to wearing braces, you’re definitely not alone. There are over 4.5 million people any given year that are wearing braces. Many of those are teenagers, but a large portion are also children and adults. In fact, at least ¼ of all braces wearers (or 25%) are adults. Each year more and more teenagers and adults are receiving braces. In the past, there used to be many stigmas about braces, such as them being unattractive. Studies show, however, that braces have become quite the luxury and are seen as such. The New York Times, for example, did an article about braces and just how important they are to people. Many families literally go without needs and many wants to receive orthodontic care, even if money is really tight. Braces are a luxury that many children, teens, and adults alike are eager to have. Just think: when wearing braces, you are wearing a luxury item. Remember, braces are something to have fun with! 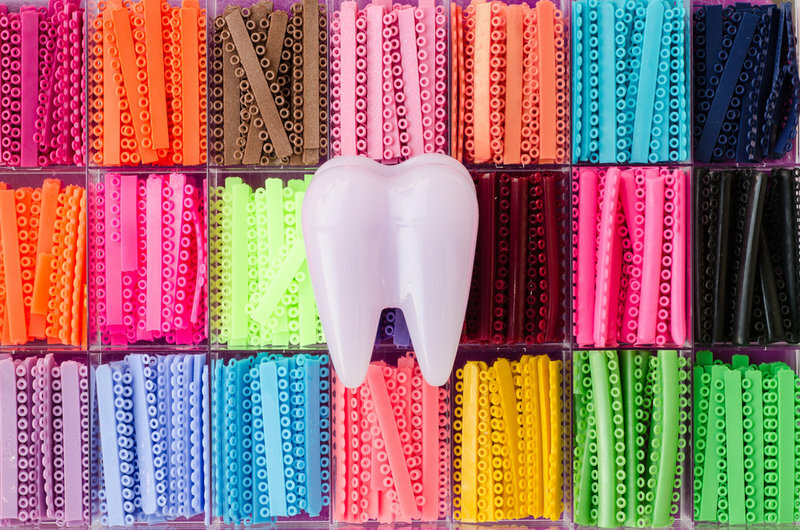 If you have traditional metal braces or ceramic braces, you can dress up your braces with colorful bands that make you stand out. Or you can choose an option that is discreet. Overall, no matter what option you choose, wearing braces for a time will help keep your mouth healthier and your smile straighter. A better smile leads to more confidence. Who wouldn’t want that? If you’re ready to receive a great set of braces, call our Belmar Orthodontics office today at (303) 225-9016!